Give your table setting the kind of beauty, elegance and charm it deserves with our quality offering of 108 inch round tablecloths. Made from finest quality polyester fabric, these tablecloths provide an ideal table cover setting for a wedding, corporate or any other type of event. 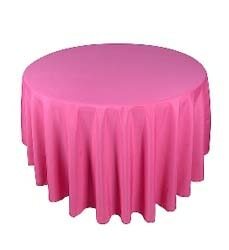 You will be pleased to know that here, at BB Crafts, we deal only in the best quality 108” round tablecloths, available in a wide variety of color choices, in order to accommodate all the requirements of the customers. Our extensive collection of 108” tablecloths offer high durability, low maintenance, seamless finish, and is available at cost-effective prices.